UPDATE October 2016: Work has started on Monument Roof!!! On April 14, 1909, the town officially received from the Winchester Soldiers' Memorial Park Association the title, interest, land, and premises and became authorized to maintain the property, to beautify the grounds, monuments, and premises and to make such appropriations necessary for the care and maintenance of the grounds and buildings. As early as 30 years after construction, public awareness of the need to continue to protect the Monument was noted. In November of 1918, Colonel Samuel B. Horne, Winsted’s Civil War Medal of Honor recipient, expressed concern about what he called the deteriorating condition of the monument. Appearing before the town's governing body, Horne sought funds for repair work and the funds were granted. Throughout the 1960’s and 70’s, some critical maintenance work was done, including stone work re-pointing as well as repairing the cracking concrete apron at the base of the monument which was then covered with asphalt. In addition, in the mid 70’s, the Winchester Board of Selectmen authorized the use of a 70-year old trust fund for the construction of a decorative water fountain on the Park grounds. In 1983 a fund-raising campaign was instituted, planned by former mayor “Pete” Francis Hicks and led by the Winsted Lodge No. 844, Benevolent and Protective Order of Elks in order to rehabilitate the tower. The campaigned renewed widespread community interest in the monument. In retail establishments throughout the city containers for donations were marked with the legend "Help Restore Our Soldiers' Monument." Other agencies and non-profits that joined in the effort included such organizations as Kehow Tribe of Red Men, the Winsted Fire Department, Girl Scouts, Italian-American Women's Club, the Winchester Volunteer Fire Department, Veterans of Foreign Wars Auxiliary, Crystal Rebekah Lodge, Greenwoods Garden Club, Conservation Commission, Catholic Women's Club, Clifton Lodge, Garibaldi Society Auxiliary, and the American Association of Retired People. 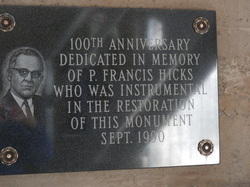 A plaque dedicated to the memory of P. Francis Hicks was installed over the fireplace on the first floor of the monument in1990 on the 100th anniversary of the dedication of the monument to commemorate Hicks and the campaign he started in 1983. One of the results of the campaign was the establishment of the Soldiers’ Monument Commission in July 1985. The commission’s purpose is to develop policy concerning the proper use and maintenance of the Soldiers' Monument and to preserve and safeguard the structure and surrounding park land. Shortly after the establishment of the Commission, the Monument was fenced off to protect the public from shifting granite. Loose stone and metal straps were placed around the tower's stone work to prevent further deterioration and movement of the granite walls. Between 1985 and 1987, in an effort to prevent the toppling of the tourelle upon which stands the bronze soldier and the further bulging of the granite rock, a major restoration was undertaken costing more than $100,000. The renovation included the removal of sections of the exterior walls and refortification of the tourelle. However, further exterior work that had been recommended in engineering studies remained untouched because of the lack of funding. The purpose of the renovation that had been completed was primarily to prevent further deterioration and allow for the safe use of the facility. In 1987 the Monument was re-opened to the public on a limited use basis. By the end of the 1990s water leaking within the building became worse. The tourelle supporting the soldier began cracking away from the main structure and leaking water in between the structure's walls began to cause cracks on the interior walls and powder the cement. The fireplace mantle on the first floor began to crumble. Inspection of the gateway showed continued leaking between the stones. Stones at the gateway pillars had begun to separate. The walkway leading to the monument from Crown Street further deteriorated and began to sink. Most of the work now needed had not been part of any previous renovation plans and was a result of the 100-year old ageing. Since 1994 the Soldiers' Monument Commission has been investigating the need for more extensive renovations of the building and grounds. In an effort to gather local support for the work, the commission has been raising public awareness of the monument's condition and the beauty of the grounds with public events and building openings. Additionally, the commission has sought capital improvement funding from the limited local budget. In 1999 the Town of Winchester approved funding for a $15,000 extensive engineering study of the Monument buildings, walls, and grounds. The engineering report estimated that in the year 2000 minimal renovations needed for preservation and beautification would require an estimated $300,000 in funding. This recommendation did not include other suggested park restoration including tree removal, development of driving and parking facilities, and lighting and safety alternations that had been recommended by the Commission. Since 2000, the Commission has held two area-wide fund raising campaigns, has been able to secure special grant funding from town projects, and a construction bond for renovation and restoration work. In 2005 the Commission recommended separating the renovation and restoration project into sections and approved a six-year plan that, with adequate funding, is aimed at completing a full restoration project for the buildings, walls, and Memorial Park. This money, however, is still short by hundreds of thousands of dollars. Strategies to gain the funds necessary to bring the facility and park to its former glory will be announced in the spring of 2013, and hopefully, much of the work will be underway by the monument’s 150th anniversary in September 2015.